Each time a new entry in the Places theme was published on Te Ara, a celebration was held in the region itself. This proved an excellent way to thank residents for their support in producing the entry, and to publicise it and Te Ara generally. A postcard-type invitation was designed and printed for each launch. 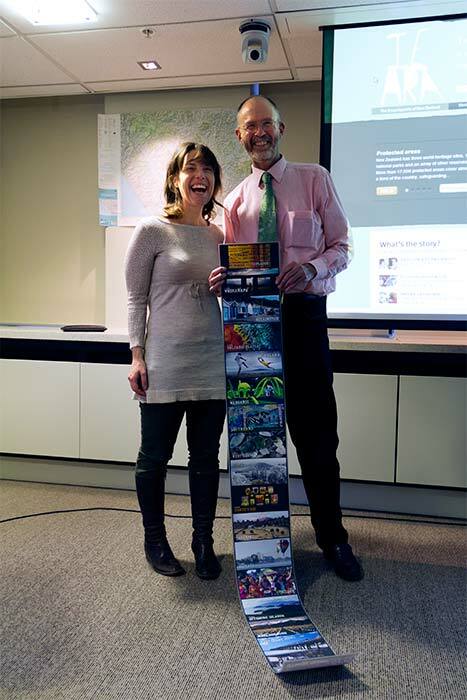 Here designer Julia Vodanovich and Places theme editor Malcolm McKinnon proudly display the entire series of invitations.